i've mentioned it before on my blog but there's an estee lauder corporate store that you have to be a member of to even walk into. estee lauder companies include not only estee lauder but MAC, clinique, bobbi brown, origins and a whole lot more. the corporate store doesn't have everything in every colour (not by a long shot) but it does have a selection from most of their brands and they're all significantly discounted! they had a huge sale recently but despite my best efforts i couldn't make it there so i decided to go the following weekend and see what they had left over. 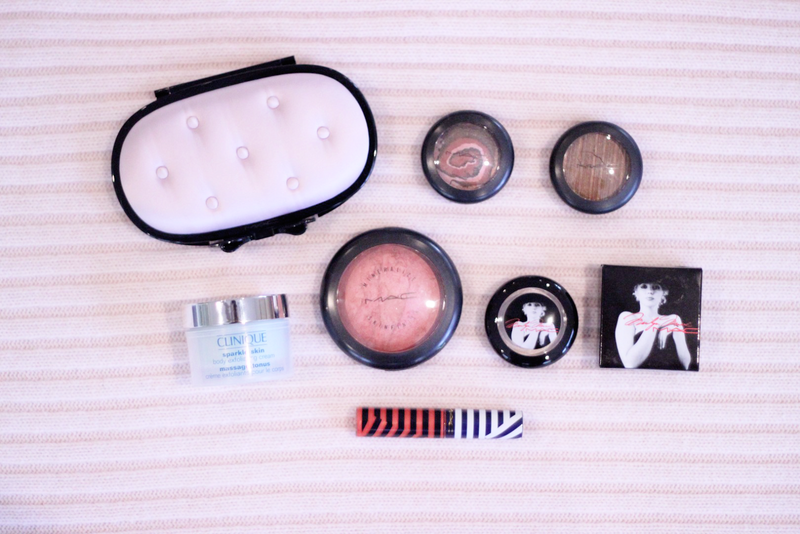 i walked away with a whole lot of (almost all) MAC products that i really love, especially the mineralize skinfinish! apparently stereo rose was a really popular limited edition shade so i was surprised to find it in the store and i put it straight in my basket as soon as i saw it. the all for glamour kit on the other hand i probably could have gone without but i got sucked in by the cute packaging, what can i say? MAC All For Glamour Kit with pressed blotting powder, powder puff and lipstick in Fashion City. MAC's mineralize skinfinishes were made in a whole range of shades so you can use them as a powder, blush, bronzer, highlighter, etc depending on your skin tone and the colour you're using. naturally i'll be using this colour as a blush and the first time i wore it i could see straight away why it's been so popular. 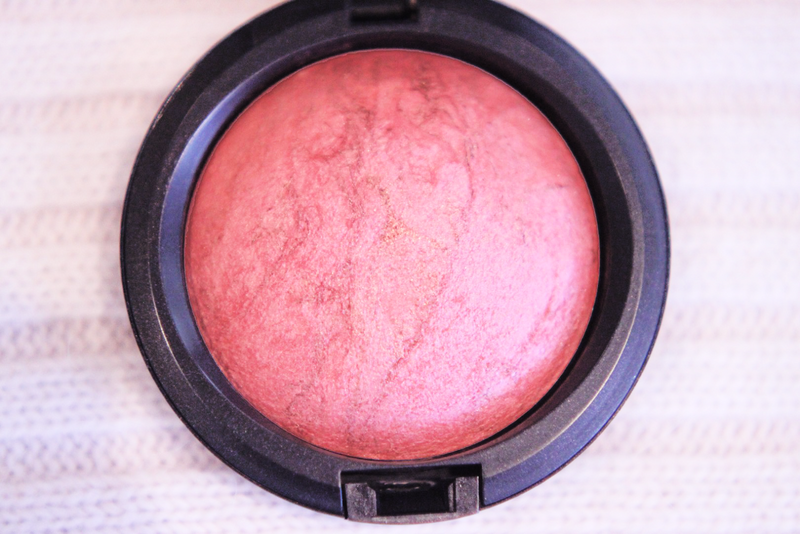 it's the prettiest colour with a gold shimmer through that looks like a blush and highlighter on your cheeks in one product. it's just beautiful! the aurora mineralize eyeshadow looks so pretty in the pan but probably a bit hit or miss as an actual eyeshadow shade, but when you mix all the colours together it comes out a beautiful medium shimmery brown. 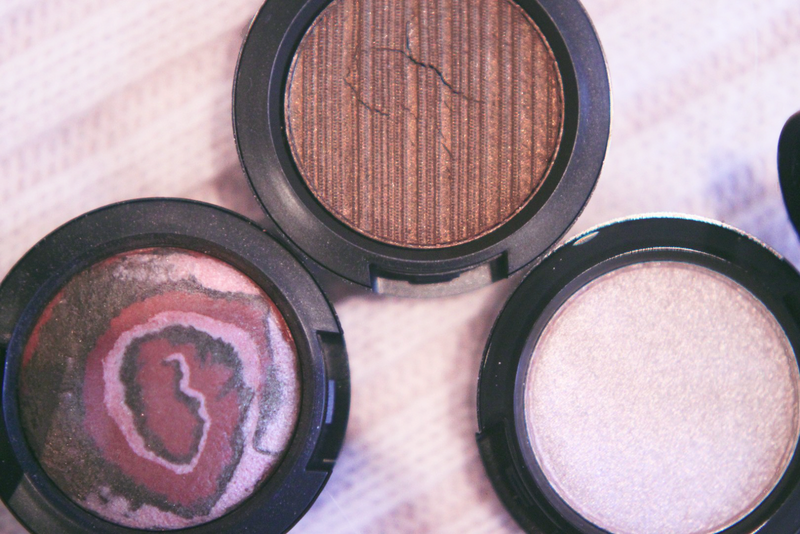 the cream eyeshadow is a deep metallic bronze and the marilyn eyeshadow is a really pretty light champagne colour. and not pictured again but the lipglass up in the first photo in riviera life is a lovely really bright orange-y coral colour which is perfect because i'm obsessed with coral coloured lip and cheek products right now. Stereo Rose is such a gorgeous shade! Be still my MAC loving heart, I think I'd go weak in the knees if I got the chance to walk into one of Estee Lauder's corporate stores. Though there is a MAC counter at a department store about an hour away from where I live, it's on the teeny side and is usually fairly picked over. We so need a dedicated MAC location - or better yet, a corporate store (that's open to the public!) around these Canadian parts, too. So glad you were able to pick up so many wonderful items, honey - have a ton of fun using all of them! aww, that's a shame you don't have a decent counter to go to and browse around! i'm really lucky to be able to go to the corporate store too, everything was a lot cheaper than in stores here. it was probably pretty close to the normal price in other country though as the markup here is so big! I love that you've gone so makeup crazy! Haha. I'm so in love with Stereo Rose! 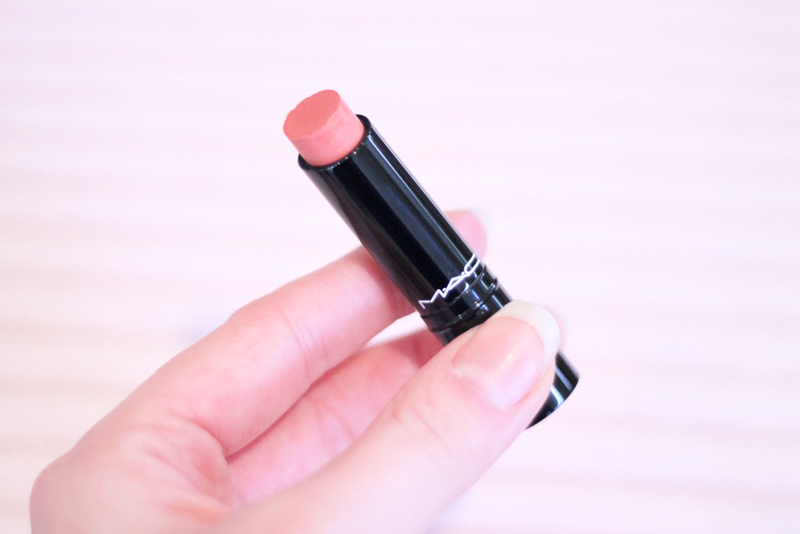 It was re-released sometime in 2009/2010, I think, back when I first got into MAC makeup, but I never bought it then, so I was so happy when it was re-re-released, haha. 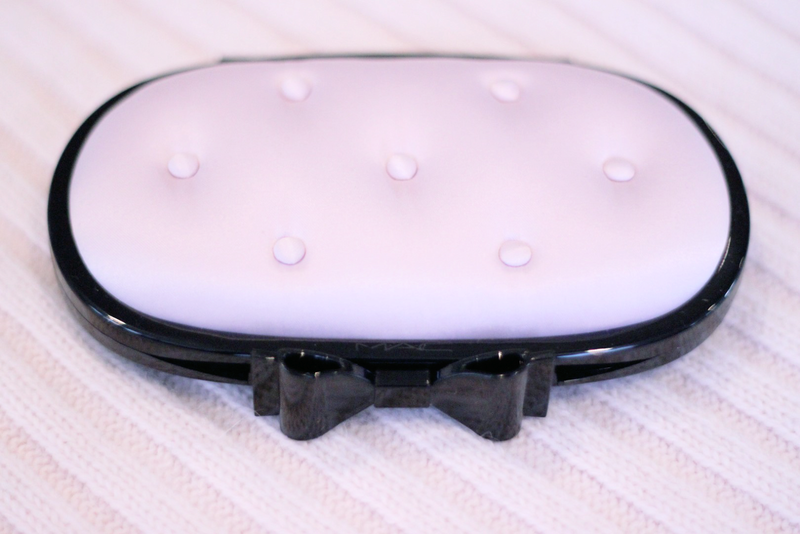 It's nice to apply when you're strapped for time because it's a blush and highlighter all in one. 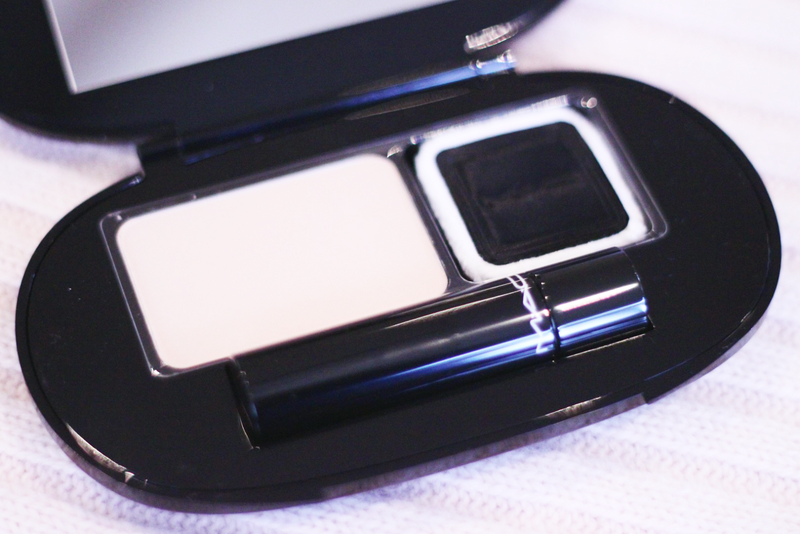 I love that it's a shade you can easily build up on, depending on how much shimmer you like. I had no idea Australia even had corporate stores like the US and the UK do! None in Perth, obviously. :p When we meet up, I can totally let you and Kat take advantage of my Myer staff discount card. I get 15% off cosmetics! aww thanks love! ^_^ well if you fancy a trip to the corporate store while you're here i can take you! I love mac cosmetic and I need some bronzers , I like your make up collection! my parents just came back from europe and my mum bought me two MAC lipsticks for 16€ which is only about $22, and as you know they're closer to $40 here! it's ridiculous! I am so jealous! 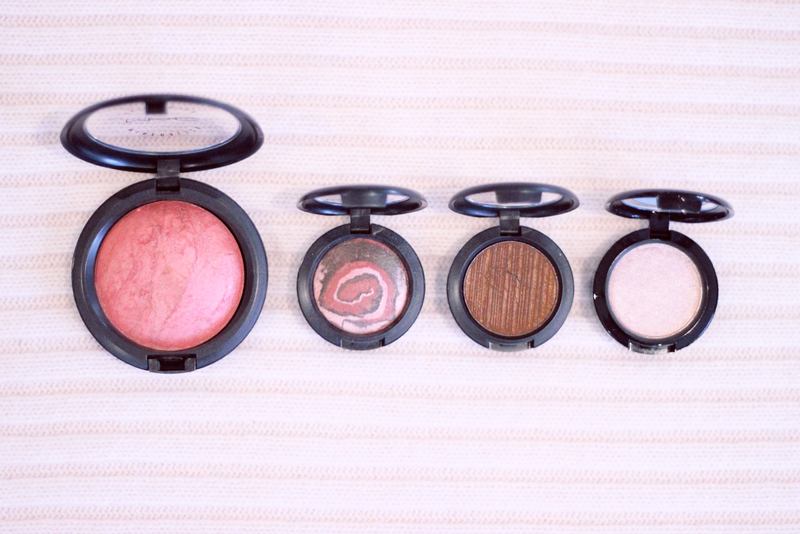 Mac eyeshadows are my go-to. They last FOREVER and look so good. I now feel like I need some new make-up. OMG I love that little cosmetic clutch thingy! That is too cute! They should make one with a red lip and mascara in it! ohh lucky you! i don't know anyone who works in the industry but it would be so great to get their extra samples every now and then, haha. I'm a big fan of mineralize too !! Oh I remember that mac packaging, I was so tempted by it. Like something from the 50's. I still have Stereo Rose from a couple of years back. 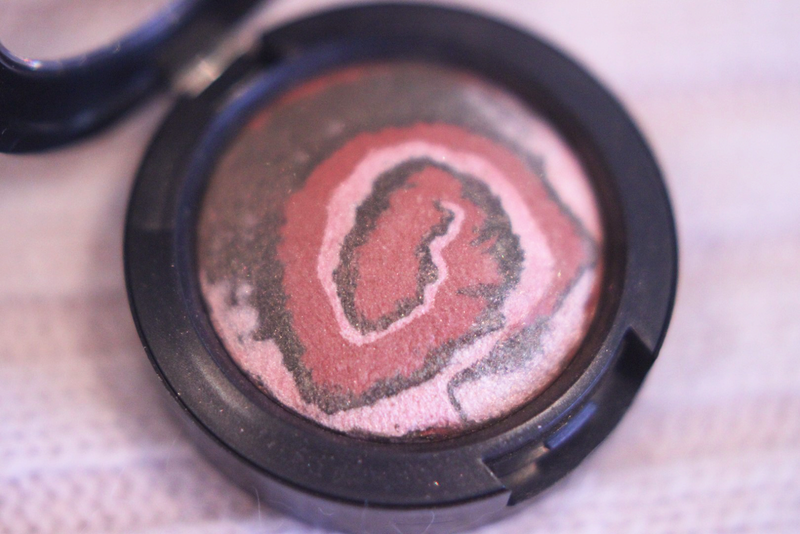 Should really dig this out soon, it really is a lovely shade. I want it all, the kit set looks so neat!! I love the coral and pink-ish tones! I love all your items you picked up! Stereo Rose is so pretty but I've never gotten around to picking it up. I don't even know if it's still available at normal MAC counters. Side note, tell me more about this Estee Lauder Corporate store! I am intrigued!